Fr. Robert Arida: Why Don’t You Become Episcopalian? This essay responds to Fr. Robert Arida’s essay “Never Changing Gospel; Ever Changing Culture” NOTE: Due to an outpouring of criticism, the OCA was forced to retract Arida’s article. You can read it on the WayBack Machine (internet archives). Whenever you hear generalized sentiments about how the dominant culture is changing and that “fundamentalism” prevents the Church from changing along with it, then you can be sure that competing values lurk close behind. Sooner or later those values appear. It’s as predictable as the beetle boring into dung. If the never changing Gospel who is Jesus Christ is to have a credible presence and role in our culture, then the Church can no longer ignore or condemn questions and issues that are presumed to contradict or challenge its living Tradition. Among the most controversial of these issues are those related to human sexuality, the configuration of the family, the beginning and ending of human life, the economy and the care and utilization of the environment including the care, dignity and quality of all human life. These words sound so smooth and so reasonable. No wonder. Sentimental thinking produces brews that are easy to swallow. But how reasonable are they? Not long ago the Episcopalian Church faced the dilemma that Arida wants to introduce into the Orthodox Church: Should moral legitimacy be granted to homosexual pairings that was previously reserved only for heterosexual, monogamous marriage? Episcopalians fought each other for several decades over the question and the traditionalists lost. But why did they lose? How could a position so clearly outlined in the Christian moral tradition be jettisoned so quickly? How could the language of the tradition be so successfully manipulated to overturn what that same tradition disallowed? To understand how this occurred we have to understand something about the Episcopalian Church. Episcopalian society is a polite society. Polite societies are civil. Those who wanted moral parity for homosexual pairings argued under the rubric of basic human fairness and decency. All discussion was reduced to the personal and Episcopalian traditionalists found it hard to rebut the liberal ideas without violating the rules of polite discourse. Liberalism and reductionism work hand in hand. The reasoning goes like this: When the personal becomes political the more difficult questions are left unasked because asking them is offensive to homosexuals. These questions reach deep into religious and cultural assumptions, some that reach back over two millennia. The unasked questions include: How do we address the shift in human anthropology that is at the center of the homosexual question (“I am what I feel”), the cultural ramification of homosexual adoptions, the redefinition of marriage from family to romantic unit, the legal ramifications of sexual orientation as a protected right, and more. Orthodox culture is different. Unlike the Episcopalians, Orthodox liberals prefer appearances of gravitas over politeness. When the liberals have a point to make, they draw out the big guns like theologian Fr. Georges Florovsky, offer allusions to recent thinkers like Fr. Alexander Schmemann, provide the obligatory criticism or two of Roman Catholicism and Protestantism, cite a relevant quote from the Fathers — all the elements necessary to enforce civility through presumptions of authority and erudition. Episcopalian liberals won the debates but they lost their church. In their rush to become relevant they became a byword for irrelevancy. The same will happen to the Orthodox Church if it trades the teachings of the moral tradition for acceptance by the dominant culture. Appearances of gravitas are just that – appearances. Esau lost the inheritance for a bowl of pottage. So can the Orthodox. If the Church is to engage culture, if it is to contribute to the culture and if it is to synthesize what is good, true and beautiful coming from the culture to further the Gospel then it will have to expose and ultimately expel the “new and alien spirits” that have weakened its authentic voice. Among these spirits are Biblical fundamentalism and the inability to critique and build upon the writings and vision of the Fathers. A tragic consequence of these spirits is a Christianity of ethical systems that usurp the voice of Christ and distort the beauty of his face. It is the saving and transfiguring voice and presence of Christ that we are expected to offer the ever-changing culture. Contrary to Arida, the defense of the moral tradition is not an introduction of “new and alien spirits” and not the usurpation of the “voice of Christ” or the distortion of the “beauty of His face.” The opposite is true. Arida introduces the “new and alien spirit” because his attempt to legitimize homosexual pairings violates Orthodox self-understanding and practice. The Orthodox Church has always been tolerant of sinners because Christ is merciful, but it has never been tolerant of sin or redefined sin as righteousness. First, there is among Orthodox Christians the idea that nothing changes in the Church. In fact, we know that many adult converts have been lured to Orthodoxy by this misconception (emphasis Arida). But is this really true? No one really believes that nothing changes. Arida’s real complaint is that the converts don’t embrace the change that he thinks they should. So what is the endgame? Should we work to find favor with the dominant culture? Should we subject the Orthodox Church to the same risk of collapse that all mainstream Protestant denominations experienced when they went sexually liberal? Do we strut our Orthodox gravitas to hide the fact that we employ the language of the moral tradition in order to subvert it? And what should we do about Arida and his enablers? Here’s an idea. Why not let those who want to Episcopalianize the Orthodox Church become Episcopalian? That way the liberals remain happy and the Orthodox don’t have to fight the culture wars that the liberals want to drag into the Church. Now I notice that Arida’s article is removed from OCA Wonder blog, and further, that Monomakhos itself is down. What’s the skinny? Do these actions portend some deep quakings within the OCA? Would stronger hierarchical action be forthcoming, or are we witnessing the demise of this ecclesiastical body into irrelevance? Monomakhos is back up. I think they were doing some maintenance. You can find the Wonder Blog essay there too. “Orthodox gravitas” is merely the Orthodox version of Episcopal politeness. Both enforce an arbitrary norm of civility in which the hard questions are not allowed to be asked. Call it political correctness Orthodox style. My hunch is that neither Florovsky or Schmemann would stand for it. If you are arguing that Fr. Arida’s essay constitutes sound theological discourse, then you need to read Let Your Yea Be Yea and Your Nay Be Nay. I’d like to mention that many if not most of our Orthodox Churches have forgotten or seemed to have forgotten the purpose of a Church such as ours which is to worship and live the Christian path to Theosis, and to maintain our Sacraments on a regular basis. Instead the Church has focussed on ethnicity – culture, dancing, cooking, clubness, language and such – and yet we get no comments from those in admistrivia. I wonder why that is. As far as growth in the church – we’ve lost more than we have gained,and I believe that it is because of our “club atmosphere” that exists there. The recent article from the Greek Orthodox archdiocese proves the point – “90% of Greek-American don’t participate in the Orthodox church, why is that? Can we take a guess! I’m an Orthodox Christian, not a very good one I might add, but I do attend. I’ve also begun attending an Episcopal Church where their focus is not on English culture, but on Christ, love and reaching theosis. Why is that wrong? In my mind it isn’t – I’m being spiritually fed by a church that many people dislike for a number of reasons. I can tell you that this church is packed every Sunday, it preaches the message that churches are suppose to preach with a priest who can connect with his congregation in a way that many others can’t. No condemnations please, just at what time and date will Orthodoxy become like this Episcopal congregation that is doing right in litugy and life. I could go on with other issues, but that is for another time. John C – If I may respond. Part of the strength of Orthodoxy has always been its awareness of cultural/racial differences, and, where applicable, allowing/encouraging national Churches to develop their own Orthodox self-witness. At least, in the Slavic countries, this has been the case. However, in the UK, France, and especially in the USA, this ‘national church’ is often villified, demeaned, and treated as the “Anglo… at the back of the bus.’ Starting with Bp. John Maximovitch’s desire to enable the French to have their own (read, ‘non-Byzantine’ rite) up to the ‘Western Rite Vicariate’ on-again, off-again ‘canonicity’ in any number of US jurisdictions, the disconnect (even as a ‘proposition Ethnic Church,’ if you will, with a nod to the similar heresy of a ‘proposition nation’ on the political sphere) is palpable, vast, and clearly phyletistic. It’s not an ‘either/or’ with True Christianity, it has to be a ‘both/and.’ Nation/Church; Narodnost/Ethnicity; Symphony and Theosis. 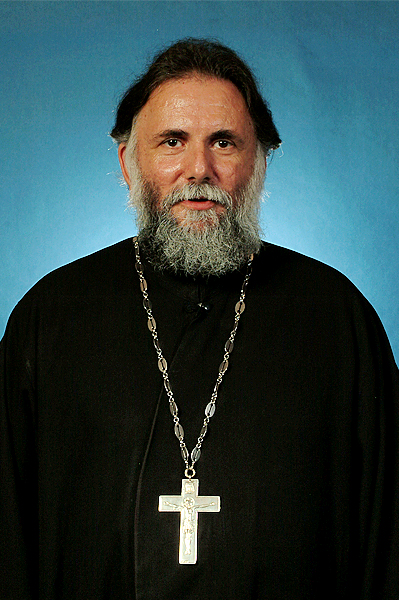 Orthodoxy failed (and continues to fail) in the US, precisely because we DIDN’T/Don’t embrace the unique racial, cultural, ethnic, and linguistic norms that the BCP, the KJV, and Nashotah House stood for upon Tikhon’s Pastoral Visit early last century, but instead became a ‘propositional faith’ that morphed into Byzantine Uniformity redolescent of the most stringent Papist decrees; and/or a desire to go the way of Vatican Ewww – and the less said of that sorry communion, the better. If Orthodoxy in the West is going to avoid going the way of all [perverted] flesh, whether aping the non-Europids of the world, or worshiping the Asherah of the Sodomite Fringe, she had better jettison the Multicultural Metissage Message of former [Jewish] Sarkozy of France, Bogus Blair of Britain, and Marxist Merkel of the former DDR, as well as the blasphemy of “Franky the Last” and the SCOBA inclusionists such as the Arid[-a] minds of certain ‘clergy’ in SCOBA noted in this column. ‘oikos’- household, family, lineage, nation]. The heresy of Egalitarianism and Democracy have corrupted the Church of God, Orthodoxy notwithstanding. And it’s time to repent of it. A national American Orthodox Church would be extremely difficult to have. American culture is made up of many cultures. I myself have gone into Greek Orthodox churches only to be questioned as to why I am attending if I am not Greek. Regardless of holy scripture and what any orthodox group claims, they appear to be always staying within their ethnic origins. This is O.K., in my humble opinion the Orthodoxy of an American who preaches the same Christ as any true Orthodox, who does not waver in his Orthodox understanding should be accepted by Orthodoxy but this is not the case. This is a problem in America. Having a western bent to worship is not a sin. The culture of the people will not change. (Maybe through time but not very quickly). One either lives and preaches an Orthodox life or one does not. Culture, language, skin color, or race should never be the issue. Only whether one serves the Christ as God has established that we do. Jesus is not going to change. What is sin has always been sin and will always be sin. The ‘Church’ worldwide will suffer. That is prophesied, what will the ‘Church’ do? It needs to begin to recognize those who indeed live a life in Christ that is true to the Christ and stop worrying about whether or not the ‘other’ conforms to ‘another’s’ specific ethnic bent but whether one actually lives an Orthodox life.